I stop recording. 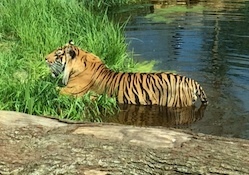 They didn’t sent me to Regent’s Park for research – I set the big cats free when the water rose, I have to get them back into their enclosures again. I didn’t think they’d work together. A low growl in the tall grass – Cinta. But when she shows her face, I know the stun gun isn’t going to cut it, despite my modifications.